This comic book certainly makes an impression with its hardcover presentation. The covers are actually made of metal, and the whole thing is designed to encased the book. Impressive. 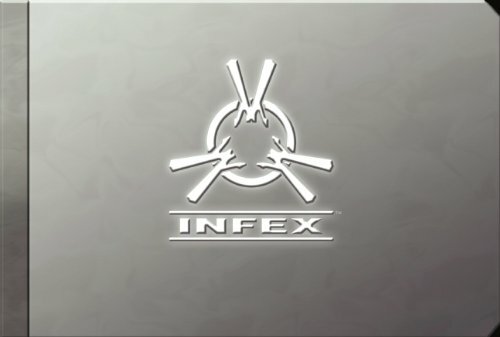 Infex is created by Keith Arem and Brandon Humphreys with art from Shake J.
Keith Arem has worked on games such as Call of Duty: Modern Warfare 3, Saints Row: The Third, The Amazing Spider-Man, Transformers: Fall of Cybertron and more. The story here is that of an evil biochemical company gone to the dark side, trying to create some mutation. The protagonist is Evelyn “Ivy” Kendall, daughter of the top researcher at the same company who was killed years ago. Years ago, her dad somehow managed to cure her of cancer. And guess what, the daughter is now all grown up going back to the same company. Her dad probably has the last laugh because he has hidden something in her that the company wants. I shall not spoil the story too much by saying that it's a thriller. The art direction for the comic looks pretty cool with its sleek art, muted tones and glowy feel. The only issue I have are with the panels. It's like looking through the sci-fi spaceship windows into the action, and the panels are often too small or the view is often too close to make up what's happening. However, the story and dialogue are good so it's still easy to follow along. There's also a free iPad app around with the same name Infex. It's a huge 1.91GB download. That's the multimedia component for the book that features the story told in comic book video format. Basically, they animated the panels from the book and added in voiced dialogue. It looks great because the panels are much larger, and the storytelling is more coherent in this format. However, you only get part one of five free, which means you have to pay to access the other four parts to complete the story for a total of US$5.